As flames engulfed the historic Notre Dame Cathedral in Paris, France, shock and concern marked reactions around the D.C. area. James Shepherd, director of preservation and facilities for the National Cathedral, called the catastrophe devastating in a conference call with reporters. “Obviously, this breaking news is devastating for those of us like me who care for heritage churches,” Shepherd said. Much of the cultural significance of Notre Dame was built into it as a way to tell religious stories, according to Shepherd. He mentioned that wasn’t damaged by the fire could be damaged by the water extinguishing the flames. Shepherd also discussed the National Cathedral’s fire safety protections, which are in the midst of being updated. While Notre Dame is 850 years old, the National Cathedral is 111 years old making it a “modern cathedral,” said Shepherd. Shepherd said he expects money will be the biggest obstacle in repairing the damage done to Notre Dame. The Basilica of the National Shrine of the Immaculate Conception in Northeast D.C. is accepting donations for Notre Dame online. Director of Virginia Tech’s French program, Richard Shyrock, told WTOP about how difficult it is to put the devastation of the loss into words. “I’m just sick seeing this, it is such a tremendous loss,” said Shryock. Shryock lives in France during the summer months and has been to the cathedral on many occasions. He said when going inside, you can’t help but marvel at the intricate stone work which makes the stone look like lace and the cathedral’s magnificent stained glass windows. “They’ve stood there for centuries and it would be a terrible loss if those are damaged or destroyed,” he said. 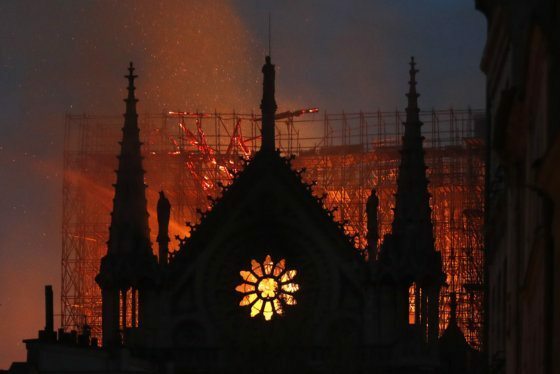 Shyrock said it’s so devastating that a cathedral that has survived so much, including two world wars and a revolution, is now so heavily damaged in a fire. “It survived all of that, only to be destroyed here in what perhaps was only an accident,” Shryock said. He said the cathedral is so intertwined in French culture, history and religion so describing the scale of this loss, is hard to put into words. “One of our closest countries has lost an important part of itself,” Shryock said. In a statement released by the Archdiocese of Washington Monday afternoon, Cardinal Donald Wuerl said he reacted with horror when he saw pictures of flames leaping out from Notre Dame. “Having visited that magnificent Gothic church and prayed in it many times, I join all of those in France and elsewhere who receive this news with such pain,” Wuerl said. In addition to accepting donations for Notre Dame, the National Shrine tolled its bells 50 times at 6 p.m. Monday to mourn the damage the cathedral has endured, “and to mark the beginning of a new day of hope and resurrection for the Notre Dame Cathedral,” the church said in a statement. The president of the U.S. Bishops’ Conference Cardinal Daniel DiNardo released a statement to the people of Paris emphasizing Notre Dame’s significance to the rest of the world. “The horrific fire that is engulfing the Cathedral of Notre-Dame de Paris is shocking and saddens us all, for this particular cathedral is not only a majestic Church, it is also a world treasure,” DiNardo said in the statement. D.C. Mayor Muriel Bowser tweeted her support to Paris Mayor Anne Hidalgo. Washington, DC joins all those around the world who want to help bear the weight of Paris’s grief. During this moment of tragedy, we send our condolences and support to Mayor @Anne_Hidalgo, the Notre Dame community, Paris, and all of France. Maryland Gov. Larry Hogan described the scene of the burning church as “horrific,” and tweeted support to first responders on the scene. Our hearts are breaking watching this horrific scene. Notre Dame is one of the world’s most iconic cathedrals. Our prayers are with the first responders and everyone involved. D.C.-area student Kelly Weymouth is studying in Paris this semester, and witnessed the cathedral ablaze from a boat on the River Seine with her mother, who had come to visit. Weymouth’s boat was stopped near the burning cathedral, and she watched as the spire collapsed in flames. “We had to stay in one spot so we were actually next to Notre Dame for like 45 minutes, just watching the fire. And, eventually, the tower came down — it was just very, very crazy,” Weymouth told ABC News. 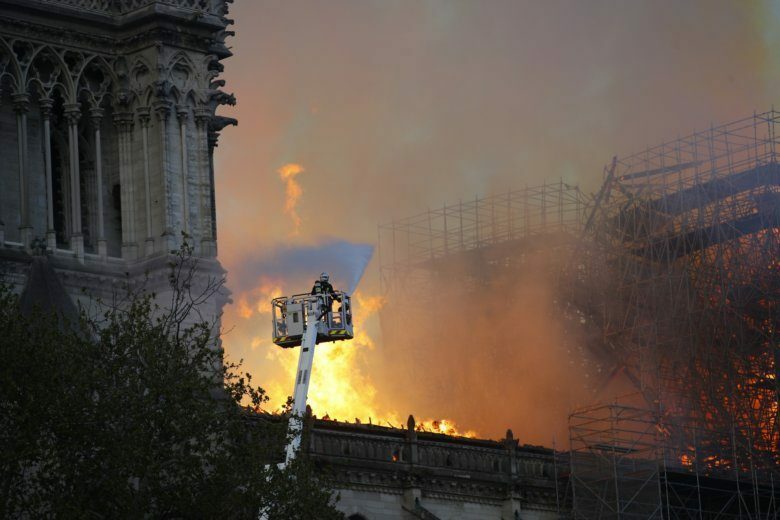 Paris officials said Monday night that the main structure of the cathedral is “saved and preserved,” and the fire has stopped from spreading to the northern belfry.